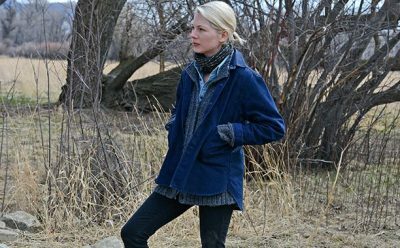 Kelly Reichardt’s just-out feature titled Certain Women seems to be a minimalist piece as well, but it only takes you to Montana, keeps you there… and is totally devoid of anything approaching the far out. 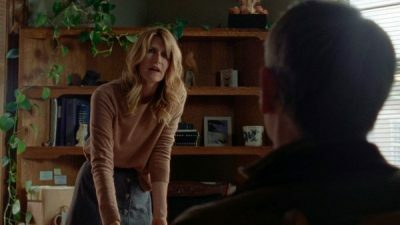 More to the point, it’s terribly so much about what is ordinary, bleak and mundane, although Women has three well-known and respected actors: Kristen Stewart, Michelle Williams and Laura Dern. Gina (Michelle Williams) plays the wife of a man who’s building the family a home outside town. She, her husband and their teenager daughter are living in a tent until the home is constructed. Talk about rural funky. Beth (Kristen Stewart) lives about five hours time from the town in which Laura and Gina live. Weekly, Beth must drive to the town and teach an evening class. Stewart’s role has her working at a law firm in her town that is, as I remind you, five hours away. Another young woman named Jamie (Lily Gladstone) also resides in Laura and Gina’s town. Just by chance, Jamie happens to see a few cars pulling into the parking lot of the local school where Beth shows up each week for the class she teaches. Jamie merely walks into the classroom, sits down… unknown to any of the other people in the room… and from a back-of-the-room desk, begins to slip into girl love with Beth. Jamie quietly sits and looks happily at Beth as the class proceeds.